This is just something that has been on my mind for quite a while that I felt I needed to express. According to the trend on social media, it seems as if everyone hates black women. 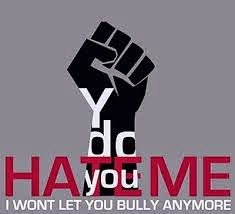 When I say hate, I say it in terms of either being mocked, ridiculed and scrutinized for everything we do. For right now I'll just address black men, because they in my opinion batter us the most. How dare you try and be misogynist and treat your counterpart like dirt simply because you are powerless. You feed into this patriarch of which you actually have no role in, here in the USA. It's sexist and extremely racist, and because black women are so used to these roles of powerlessness meeting (being female and being black) we have somehow gotten used to this and allow this to happen to us daily. I've refused and will continue to refuse this type of behavior especially from a powerless man who's only strength is his 140 characters on twitter. Or that stupid picture of the black man holding the world and the black woman looking on in disgust with some sort of caption where she demands more. REALLY? Is that what you think of me, your mother, and your sister? I love black men, and will never spit hate speech about you, because within that love, lies respect. I don't get it, all I've done is stand by you, good or bad, bear tie children, help you on your feet, and have been the only person who actually even lets you be a man. We are the only people who actually give you sense a power, and this is how you treat us? Get it together please.